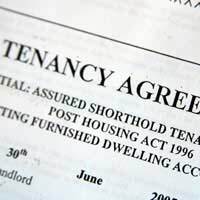 You also need to make sure that the forms are up to date, as the wording on tenancy agreement forms that were printed before 2007 is unlikely to comply with the tenancy deposit scheme. A form that dates back as far as before 2002 might not comply with the Office of Fair Trading guidance on the Unfair Terms in Consumer Contracts 1999. It’s not a good idea to set the initial tenancy for any longer than six months, unless you know and trust the people who are going to be moving in. The reason is quite obvious – if they turn out to be nightmare tenants, you don’t want to be stuck with them! It is normal for a tenancy period to term be six months or sometimes a year, but there are no legal rules on length of tenancy – it can be any amount of time that’s agreed by you and your tenant. In a normal assured shorthold tenancy the tenancy carries on after the initial six months (or whatever period you agree) on a monthly basis if rent is paid monthly. Don’t amend a standard tenancy agreement without talking to a professional. If you amend a clause, in some cases it could make the entire tenancy agreement invalid because it makes the agreement non-compliant with the law. What Other Information Should I Include in a Tenancy Agreement? You must make sure that the agreement contains and address for you in England or Wales, to ensure that the tenancy agreement complies with the Landlord and Tenant Act 1987. If you will be living abroad, you can insert the address of your agent in England or Wales instead. You also need to state very clearly which payments the tenant is responsible for and which will be covered by you as part of the rent. If you’ve agreed to pay bills such as water, council tax gas and electricity, you should also insert a clause in the agreement that allows you to increase the rent if and when the cost of the utilities or council tax increases. It’s best to also include an inventory of all the property contents and the condition they are in at the beginning of the tenancy agreement. Agree this with the tenant when they move in so that there are no disputes at a later date.If you have asked the tenant for a guarantor, you need to have the correct documentation signed and agreed before the tenant moves in, and ideally even before the tenancy agreement is signed. You need to do this even if the house is unfurnished, to cover things like damage to carpets, decor, and light fittings. It sounds obvious but you also need to make sure that the tenancy agreement is properly signed by the tenants, and that you have a copy of it with their original signatures on before you give them the keys to your property. I had tenants in an HMO, just renovated and beautifully decorated, who would not cooperate. They left laundry all over the house including a display of men's underwear in the dining room, refused to wash up - every dish was dirty - all over the kitchen bench, smoked in their rooms even though they had a written agreement not to smoke in the house, brought friends with suitcases to stay in the house for extended periods, refused to let me into the room with the boiler and did not tell me the boiler was leaking. This ended up with me trying to move into the empty room in the house to try to make them change their ways.I was locked out of my own house at 11.30pm.I tried to push past to get to my room, but they had brought in a large martial arts heavyman to threaten me and keep me out. I am a 61 year old woman. He pushed me out and I pushed back. I ended up scratching this thug and they shouted 'assault', called the police, and I was thrown in a police cell for 14 hours.What are you realistically supposed to do with dirty, irresponsible tenants? Wait 6 months and have rats and bedbugs?